I didn’t serve in uniform. It wasn’t on my radar in high school or college. Neither my parents nor guidance counselors even suggested it as an option. I am a civilian. The last person to have worn the uniform in my family was my grandfather in WWII. This makes me one of the 99% of Americans who land on the civilian side of the civilian-military divide. It’s what makes the day I spent at Arlington this past Memorial Day so profound. I had a privileged view of a community I’m not part of, seeing them at their most vulnerable and most profound. 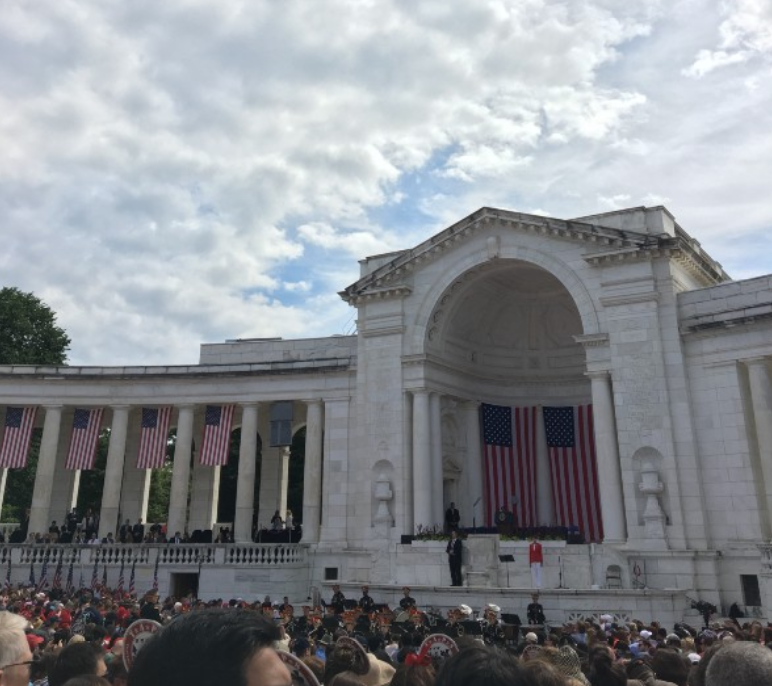 As a result of a very lucky introduction to Paul Rieckhoff and the organization he found in 2004, Iraq and Afghanistan Veterans of America (IAVA), I’ve spent a few Memorial Days at Arlington. It’s always been impossibly hot and sunny. It’s the best weather to go the beach; the worst weather to sit in a bowl of an amphitheater on white marble benches and walk the cemetery grounds with little shade. After forfeiting our drinks to the Secret Service, the routine is the same: ferry solo cups of water from the water stations outside the amphitheater in, keep an eye out for folks about to pass out, fan ourselves with the TAPS paper fans, try to share pics over a very poor cell connection, and meet Americans from around the country while we wait for the President and his entourage to arrive. As we wait, the Army Band reminds us to be muscular and solemn yet chipper with marches and renditions of Amazing Grace. The processional of flags from the older veterans groups kicks off the ritual. We stand for the anthem (twice), hear 21 cannons salute before the President lays the wreath at the Tomb of the Unknown Soldier close but out of site from the amphitheater. President Obama paid direct tribute to the Gold Star Families — especially the children, whose parents will never come home. And he eulogized some of the more than 20 service members who have lost their lives in the last year. He shared stories of the lives and heroic deaths of Charles Keating, Louis Cardin, and Joshua Wheeler, honoring his wife Ashley and 10-month-old son, David. They received the most energetic standing ovation. From there we walked to Section 60, the newest section at Arlington National Cemetery. Section 60 should be known to every American, like Ground Zero or Selma. Section 60 is where we bury our newest fallen. Because we are a country that is and has been at war for over a decade it is where we have buried some of the 6,717 American service members lost in Iraq and Afghanistan. As a civilian without real military ties, I didn’t have a friend or family member to mourn at Arlington. I didn’t have a band of brothers or comrades in arms. It’s one of the privileges of being part of the 99% — we don’t serve and we tend to not know those who do or have. And so, we don’t live with the ongoing grief of their early deaths. 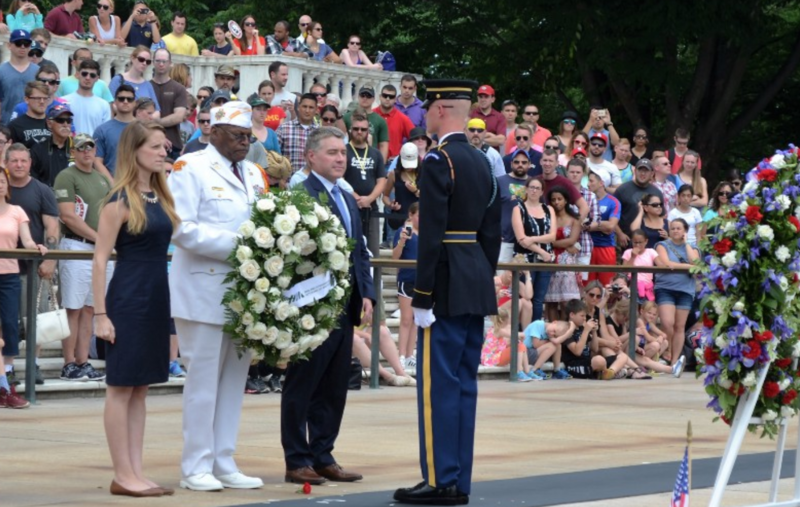 Earlier I had reached out to friends and coworkers who couldn’t make it to Arlington to see if they had loved ones I could visit on their behalf. The Memorial Day Flowers Foundation ensured that I, like everyone else there, had something beautiful to leave behind flowers in hand I went in search of their graves. Arlington National Cemetery has an app to look up the exact location of each grave — necessary in a cemetery with 400,000 graves — but using the app felt like cheating, too easy. Instead I chose to walk the row upon row of tombstones. It was hot and I was in a suit and tie. But walking felt like the easiest of sacrifices I could make. Sweating it out, feeling the sun cook my forehead, I read each stone and became lost in a world of brothers, sons, daughters and parents who were taken too soon — people who died defending me and my family in countries I’ve never been to, against threats I only see on TV. War is casual or absent for most of us. 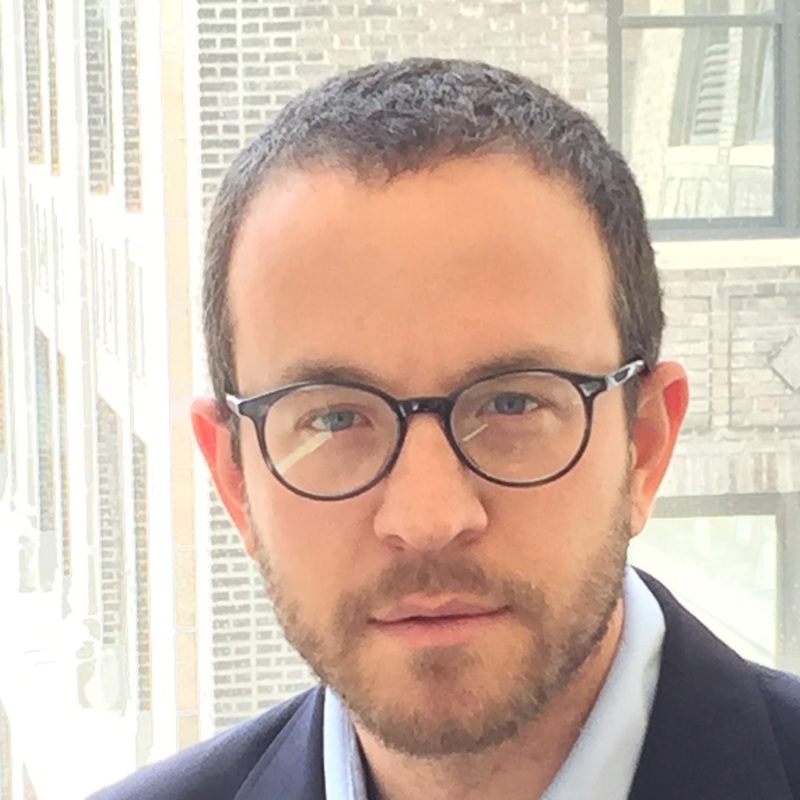 The news sometimes reports on attacks, casualties and lost lives but more often than not, we discuss the wars as evidence in foreign policy arguments that seem remote in our daily lives. Standing among the tombstones, the price we pay as a country, as a culture, as human beings, couldn’t have felt more real and more tragic. I didn’t have any stories or memories to go with each name, but just reading them (sometimes whispering them aloud) and adding the few available details — a rough calculation of how young they were, the medals they won, and the religious iconography they chose to put on their tombstone gave each a brief story. Arlington National Cemetery is a most public space, with the most private of moments. The white rectangular graves are disciplined in perfect rows and columns. 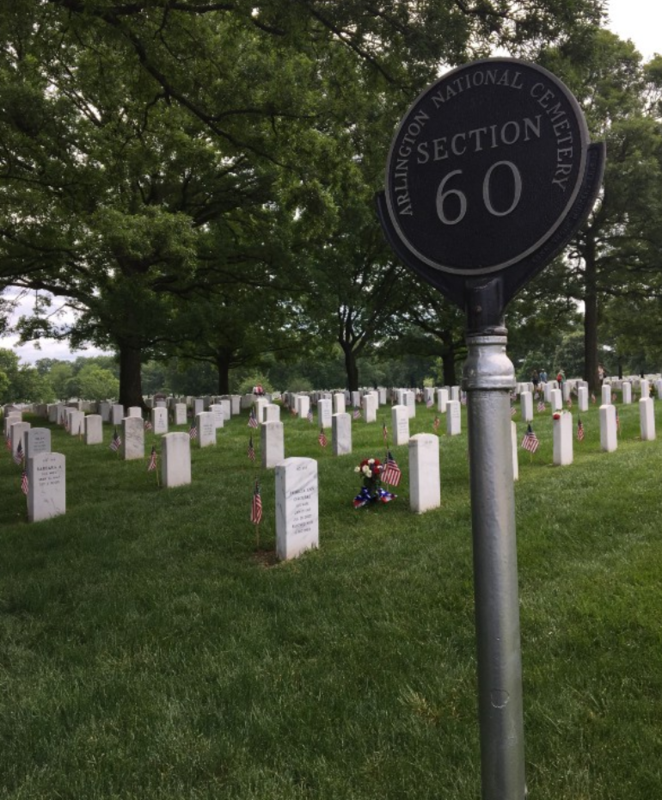 On Memorial Day, the spaces between these rows are filled with visiting parents, children, friends, sisters and brothers, and sisters and brothers in arms. As I walked, I passed a mother curled sleeping or crying or both across her son’s grave. I heard families sharing stories over their daughter or son’s favorite beer. Some of the younger kids didn’t really understand what was going on — some never even met their lost parent — were looking for entertainment. I’ve been to Arlington on many Memorial Days in the last seven years. Every year more and more rows of graves are added. It’s a tragic visualization of the mounting lives lost. The rows mark the progression of wars that most of the country — particularly the 99% of us — rarely think about, except the families who know the harshest cost or who live day to day fearing it.